Thengai paal sadam (Thengai paal - Coconut Milk; sadam - Rice ) is my most favorite recipe that is often made in my family and also in my extended family and is a must served recipe for guests. This looks simple but flavorful and goes with both vegetarian and non vegetarian curries; that is its specialty. This is very easy to prepare once extracting of coconut milk is done. I made this recipe once with the store bought coconut milk. But I find it not much tasty as made with home made coconut milk. 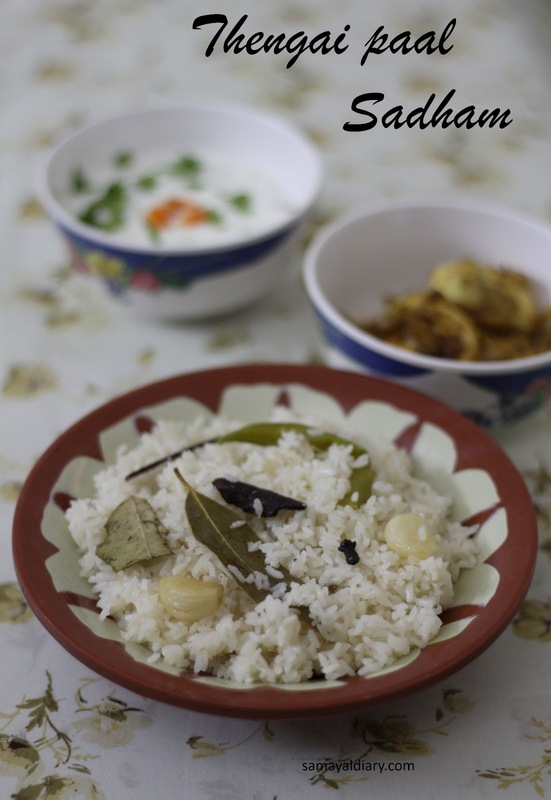 Also this tastes much better when prepared in Jeeraga samba rice to basmati or raw rice. My Mom usually prepares this along with a rich and thick tomato gravy with all the vegetables added and without adding coconut. But since I am preparing this just for two of us, I made egg fry instead of gravy as an accompaniment to this rice. Also, coconut oil is traditionally added for recipes like this. But I prefer normal cooking oil as the coconut milk itself brings so much flavor and taste to the recipe. This recipe is always made when we all gather together in our aachi's (grand ma) place and they make it in electric rice cooker so that it stays warm for a longer time. There is no one in our family who hates this rice. On the contrary (but as usual), my hus hates this to the core. So I make this very rare here. Extract coconut milk of 2 ¾ cups from half coconut. Cut onions lengthwise. Slit chillies. In a pan, heat oil, add fennel seeds, cloves, bay leaves cinnamon, garlic, chillies and onion. Fry till the garlic softens and onions become translucent. Now add the rice. Fry for a while and then add coconut milk. Now add salt and give it a stir. Allow boiling on a high flame. When the water level decreases the rice level (you can see small holes), simmer the flame (the lowest), close the lid and cook for 5 more minutes. Now open the lid. Use a fork to see whether rice is done. If not, cook for some more time. If cooking with a pressure cooker, allow one whistle. Serve with vegetable curry and raita. I served with raita and egg fry. Notes: Add little more spices and cashew nuts to this rice so that it becomes much more tasty and flavorful. Linking this recipe to Soul Food Show at Virundhu unna vanga and Walk through Memory lane event started by Gayathri's cook spot and hosted by My Home Mantra this month. i often prepare this,love the wonderful aroma of the coconut and the spices. If i dont have veggies, i'll make this rice immediately,quite a flavourful rice. so flavorful and yummy....luv it!